I'm pretty sure that at least half of the city is sick right now with a cold. Evie has been sick EVERY SINGLE WEEK since the end of November. She starts out with a stuffy nose, then a cough, and then gets better, and the following week gets sick again. Thankfully, this was a healthy week for her. We were on a roller coaster of no sleep and then recovery. When she's sick, Evie inevitably ends up sleeping on top of mommy just so I can get a few hours of rest in a row. So precious, yet so hard. However, one thing is different. I was in mortal terror of her getting sick when we left the NICU last February. Now I am not. That is pretty huge. Last week, poor Evie was so congested that we had to take her to Urgent Care to make sure it wasn't going to her lungs. We are just weaning off Sildenafil, so there's that added sensitivity about her lungs. We count ourselves lucky so far. 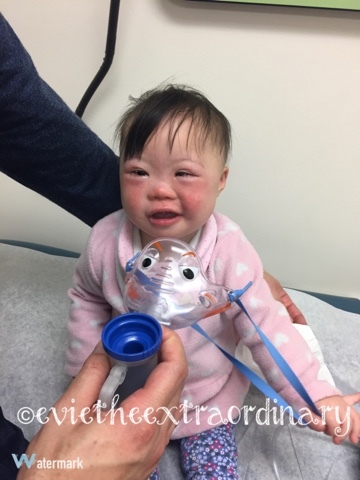 When we went to the hospital to make sure she didn't have RSV or bronchiolitis, I was afraid that I would have to spend the night at the hospital. Evie is such a champ. She went with Mommy and Daddy to the doctor and patiently sat through everything that was done to her. Rectal temperatures are the pits!! Some of our friends with Down Syndrome have had to go to the hospital due to colds turning into something more. It seems like our little ones are more at risk during the winter season. I thought I could relax about people washing their hands before touching Evie, but weeks of watching Evie suffer are making me more vigilant again. She will grow out of it as she gets older, but we just have to get through the winter! Just for fun, a map of the most frequently unwashed parts of our hands.